The city was first settled in during the Early Classical Period and the first king is dated to 431 AD. The city controlled, through a series of alliances, a large swath of modern Chiapas and northern Guatemala. In 599 Calakmul invaded and sacked Palenque. They returned again 611, when the king of Calakmul himself came to Palenque to instill his power. In 615 everything changed when the 12 year old King Pakal the Great came to power. He ruled for nearly 70 years and took power when the city was weak. With great leadership and power he restored Palenque to its former glory. During this time Pakal the Great allied Palenque with Tikal and Yaxchilan, making the three cities a powerhouse that controled and conquered the region. The city even surpassed Tikal as the political and cultural centre of the area. The next two successors continued to build and carry out the ambitious projects of Pakal the Great. In 711 Palenque was defeated by the kingdom of Tonina and the current king was taken prisoner, and most likely executed. The city continued to decline until it was abandoned roughly 150 years later. When the Spanish arrived in the 1520s the population of the area had been greatly reduced and little remained of the once mighty power. Upon entering Palenque main entrance you will see to your right the Templo de la Calavera, Temple of the Skull, which is named after an animal skull relief sculpture at the base of one pillar. The next temple is not very interesting then the third temple, Templo XIII, is quite fascinating. In 1994 a female dignitary was unearthed with a malachite mask and around a thousand pieces of jade. Some think this woman might have been Pakal's wife because of its proximity to Pakal's tomb. It is possible to enter the centre of this pyramid to see some amazing murals and few sarcophaguses. 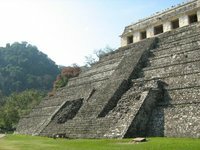 Templo de las Inscripciones, Temple of Inscriptions, is one of the magnificent burial pyramids in all of the new world and the tallest building in Palenque reaching over 25 metres. The central staircase goes up and stops at a series of small rooms. The top interior stairs leed down to Pakal's tomb, which is sadly closed to the public, underneath the trees in front of Templo XIII. Pakal's jewel covered body and jade death mask were taken to the Mexico City and put in the National Anthropology Museum. Sadly the mask was stolen in 1985. On the kiddy corner from the Templo de las Inscripciones is El Palacio, the Palace. Constructed and remodeled over a period of over 400 years starting, in the 5th century, this structure was most likely the home to Palenque's rulers. The famous 4-story tower was built in the 8th century and restored in 1955. Anthropologist believe it was used to watch the winter solstice sun over the Templo de las Inscripciones. Sadly no one is allowed to climb the tower today. The northeast courtyard, known as the Patio de los Cautivos, has a collection of relief sculptures that seem to large for the setting. It is believed these may be sculptures of rulers sacked from their respected cities and brought back as trophies of conquest. In the southern part of the temple is an underground area containing six toilets and few sweat baths. Just the north of El Palacio is Grupo Norte. This group is home to an impressive Mayan ball court and some nice temples. Although these temples are not the best persevered the views from the top are very nice facing the valley behind the ruins. Pakal's son Kan B'alam II started to design and build the Grupo de las Cruces shortly after his fathers death. The largest buildings are dedicated in 692 AD. Templo del Sol has one of the best perservered roof combs in all of Palenque and the carvings are describe Kan B'alam's birth in 635 and becoming king in 684. One in glyph in particular shows him facing his father. Climbing the steep steps of Templo de la Cruz is well worth it. The top panels are well preserved and the view from the side facing the palace is stunning. The full exposed corbel of Templo de la Cruz Foliada is worth seeing in order to see the innards of one of these stunning structures. Acropolis Sur has been closed off to tourist for the last few reasons and may be roped off when you visit. It is believed that is was part of the Grupo De las Cruces and connected by a long open area. This site has been the location of many impressive finds in the last few years including an 8th century limestone platform with seated figures and hieroglyphs telling the story of the founding of Palanque. Less developed and tourist friendly these ruins have a more rustic feel. There are also several nice waterfalls worth seeing and the hike down here is quite steep, although on a developed trail the whole way. Most people on day trips don't have time to make it to these sections making them much more empty then the rest of the ruins. Remember that you can't access this area after 3:45pm, so it is better to access these areas earlier in the day. The ruins are large room blocks that were used primarily as residences. There is a trail, not marked on the map, behind Grupo 1 back up to the main ruins making it not necessary to back track or go to the museum. It is also possible to spot monkey's in the trees above the ruins here. 8:00am to 5:00pm, with the last entry at 4:30pm. The lower gate cannot be exited after 3:30pm. Entrance cost is 51 pesos plus an additional 20 pesos to enter the nature preserve. Remember that no one is selling any water or food inside the ruins so bring supplies with you. The closest airport is Villahermosa, about two hours away by road. Tuxtla Gutiérrez, the airport for San Cristobal de las Casas is five to six hours away by bus. Both airports are well serviced with flights from Mexico City and other points in Mexico. The easiest way to get to Palenque is by bus. There are many buses daily from San Cristobal de las Casas (five hours), Tuxtla Gutiérrez (six hours), Villahermosa (2.5 hours), Merida (8 hours), Campeche (5 hours), Cancún (13 hours). Daily (one or two buses) also ply from Mexico City (16 hours), Oaxaca (15 hours), Playa del Carmen (12 hours), and Tulum (12 hours). It is also possible to get to Palenque from Flores in Guatemala by bus (6h, leaving Flores daily at 5am, US$35). It is possible to hire a taxi to the ruins. It will cost around 30 pesos one way. Most people take collectivos to the ruin. They can be found near the intersection of 20 de Novembre and Allende, this is because the cans sometimes stop at different places along the street. Look for a van that says Ruinas in the window. It ranges from 5 to 10 pesos one way depending the quality of the van and the driver. Vans go back and fourth from the ruins from 7:00am to 7:00pm daily. There are not restaurants in the ruins although outside the ruins there are vendors selling street food and other local fare. Don Muchos is a great restaurant at El Panchan as well. Great stone-oven pizzas and live music. The stone-oven pizzas cost M$60 and are very good. In the ruins themselves there is no one selling any kinds of beverages. At all the gates though there are people selling every kind of beverage under the sun. There are several sleeping options located near the ruins in an area called El Panchan. This used to be a called ranch but has been turned into a hippy/bohemian hangout near the ruins. There is all different levels of accommodation and restaurants here ranging from hammocks to luxury cabins. Mayabell is a fun option with hammocks for 15 pesos or cabanas starting at 250 pesos. It is also attached to a nice restaurants were local hippies play music every night for food and a place to sleep. Another nice feature of this place is the ability to walk to the ruins. El Panchan - It is relatively near the ruins and has cabanas and small cabins and common sleeping areas with hammocks. A cabana with access to a common showers and bathrooms facility is M$80. The little Otulum river runs through the location. Jungle Palace (In El Panchan) - Offers mixed budget accommodation from camping, dorms, and small cabañas all with shared bathroom. Showers have hot water. Dorms M$70, Camping M$30, Cabaña (for 4) from M$200. Margarita and Ed Cabañas (In El Panchan) - Very friendly, clean, but not super cheap. They have icey cold air-conditioned rooms, a bare necessity after hiking through the ruins at Palenque during rainy (and pretty much all other) seasons. Private with A/C from US$30. Posada Na'Chan Ka'an - 2a. Avenida Sur Pte (Av. 20 de Noviembre) (In the city center at the corner where the colectivos for the ruins leave). Check-in: 24h, check-out: by 12.00. Very friendly, clean budget spot in the town of Palenque. Laundry, free internet and WIFI. Hot water (also in dorms). Baggage locker M$10/day. Dorms M$80, single M$250, double M$300, triple M$350. This is version 12. Last edited at 7:41 on Aug 14, 17 by Utrecht. 6 articles link to this page.